At some point, most startups will begin to measure their customers’ happiness. Customer satisfaction is an important predictor of loyalty and can foster fantastically efficient word-of-mouth growth. 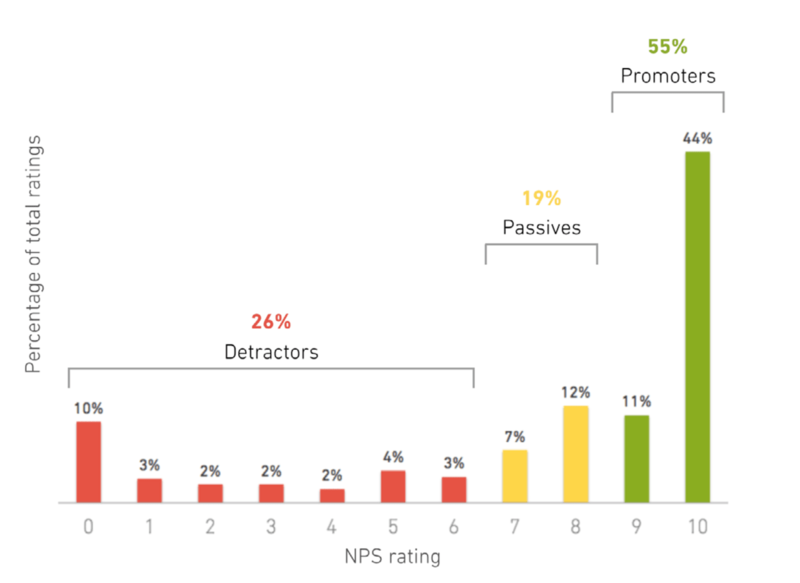 Many companies employ Net Promoter Score to quantify customer satisfaction. NPS measures the fraction of a customer base which are promoters and detractors of a company’s product. I’ve been told that NPS scores greater than 50 are impressive, but this is simply a rule of thumb. So what’s the right way to evaluate a company’s NPS report? Second, customer NPS responses follow a bimodal distribution. As you can see in the chart above, users tend to respond very positively (9 or 10) or very negatively (0). 65% of the responses fit into these three buckets. Additionally, I was surprised to learn that middle-of-the-road scores indicate customers are highly likely to be detractors. Third, the data confirms that changing a customer’s feeling about a company is very difficult. More than 70% of surveyed users who gave a negative review in the past remain critics. The converse is also true, but to a lesser extent. Previously endorsers of a product degrade to detractors about 18% of the time. Last, as startups’ user bases expand, they are are challenged to keep on exceeding user expectations. But companies can maintain relatively consistent satisfaction scores despite massive increases in customer tickets. 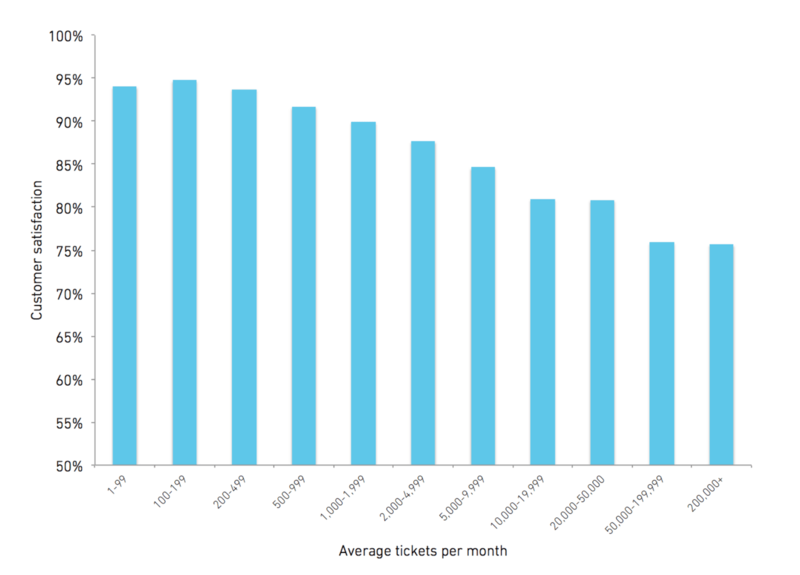 The chart above shows the mean customer satisfaction score by the average number of monthly tickets. High throughput service desks observe about 20% lower customer satisfaction than embryonic volume desks. Zendesk maintains an extensive library of benchmarks containing useful insights and benchmarks for startups seeking to deeply understand a customer’s needs and develop a passionate user base, the same way Zendesk has. If you’re looking to understand how your startup performs relative to others, it’s a great place to start.